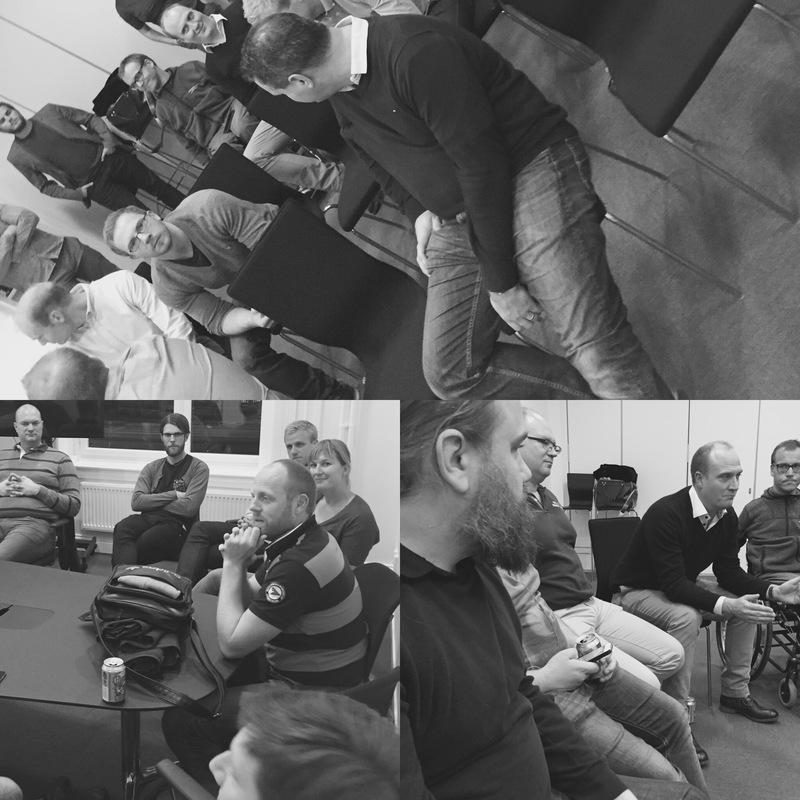 Yesterday we had an interesting meeting at the Swedish .net user group Swenug in Gothenburg. The them was “The Big Rewrite”. Instead of allowing a speaker to talk about something interesting we chose this time to make it as a discussion meeting. Two groups in two different rooms had an open discussion regarding the big rewrite. What’s the biggest problem regarding rewrite an application to new technologies? how can we work to prevent major rewrites? What does the business people in the organization act and so on. Every one agreed that if you need to rewrite something you really need to know what requirements you really need in the new version. To know this you need to measure what features are mostly used today. We need to know if we can change it to better features. We most understand what featured we can delete. We need to understand the ROI of a rewrite. It’s also important to see a rewrite as a new project not just a rewrite. 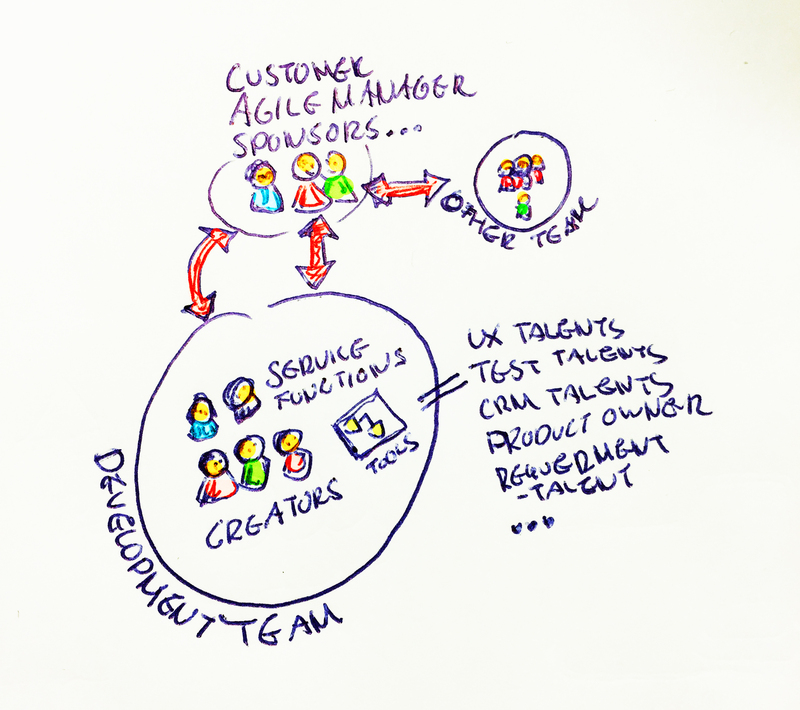 Maybe go full agile, use lean startups and so on. But the most important part is that you can’t just rewrite a product if the whole organization can’t rewrite them self. In other word, it’s not only about write new code you also need the whole organization support to understand what the new rewrite is all about etc… There is no use to take the old backlog and just add new code. 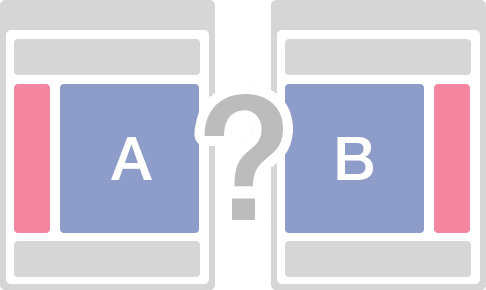 A/B testing is jargon for a randomized experiment with two variants, A and B, which are the control and treatment in the controlled experiment. It is a form of statistical hypothesis testing with two variants leading to the technical term, two-sample hypothesis testing, used in the field of statistics. It’s really hard to change or add something and know if it’s a success or a failure before we have test it on real users. In Lean UX it’s important to do this test process as cost effective as possible by decrease unnecessary waste without skipping important work. The best feedback is when you let people use it and see if they like it or not. 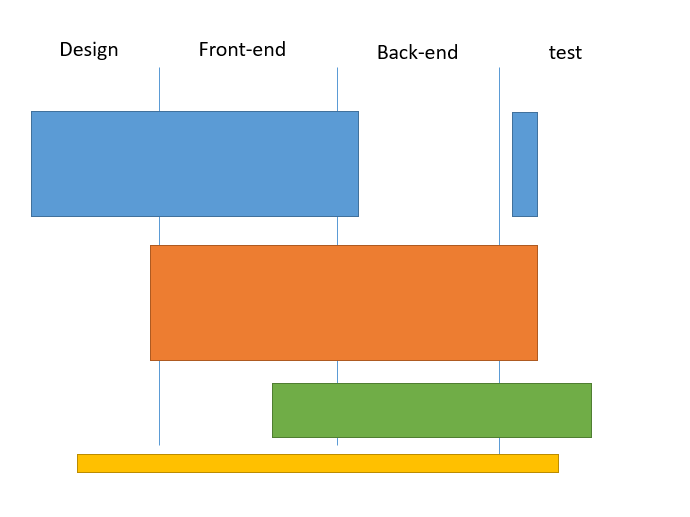 You can test wireframes, design sketches but that’s not the same as test It for real in real action. 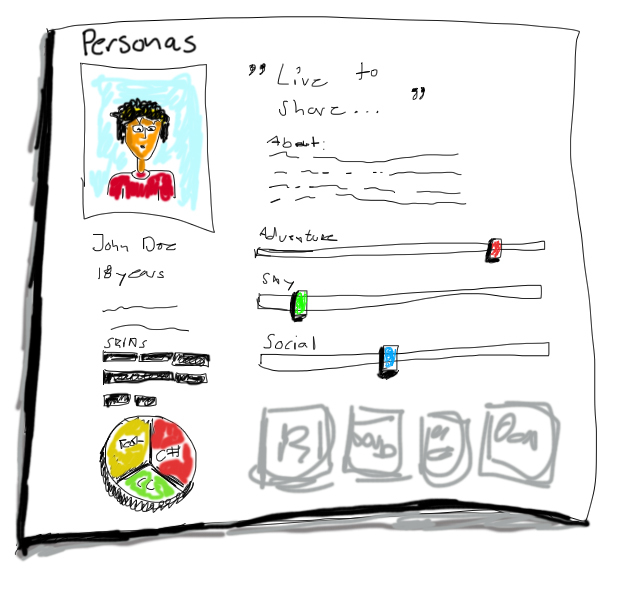 Many users will see this cool new thing as a sketch and think; that looks really cool! but is it really that cool when it’s implemented and live in action? Not all the time, maybe some times but we can’t be really sure before we can test it. In Lean UX A/B testing is one approach that can help you get early and rapid feedback if the idea is great or just a new pain for the user. The core idea of Lean UX is to aim small and hopefully shoot big. In other words, do as little as possible and test it before you spend too much time on your ideas. I love to use the creativity to think; – how can I add something simple that works and also gives me many other possibilities? It’s some kind of evil obsession I have and that’s also what I love most about software design. In this case I will show you how you can add some code to make your page not only A/B test friendly you can use this idea for other things like themes, change layout bases on personalisation and you can even use it to give your user some luxury in e-commerce sites and so on. In the software, there are thousands of ways to solve the A / B testing. 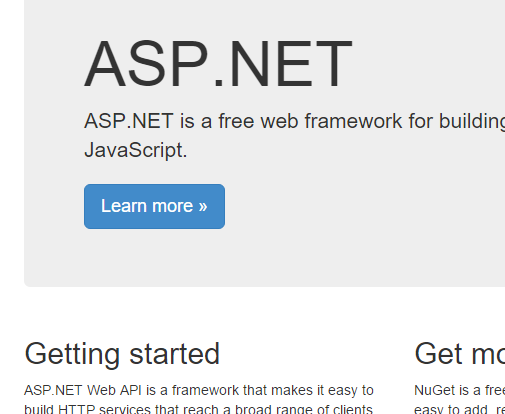 What I found very useful that also decrease waste from more complex solution is to copy the view you want to test to a new location and add changes to that new file, and then let ASP .Net MVC show just that new view based on some business rules. I also want less code, and it shall be easy to remove my test-view without too much work. Therefore, I want to use the view folder and it’s files and not manipulate controllers if not needed. It’s more waste to add new controller if you can use the the you already have when you want to test another layout. My approach doesn’t stop you from A/B test controller as well if you want to add that feature in the future. Remember I’m fan of Agile and Lean approach and principles like KISS (Keep it simple stupid) and YAGNI (you aren’t gonna need it). That’s why I keep things as simple as possible and expand it if more advanced featured is needed later on. I call the variable theme because I can use it for other purpose than just A/B testing too. 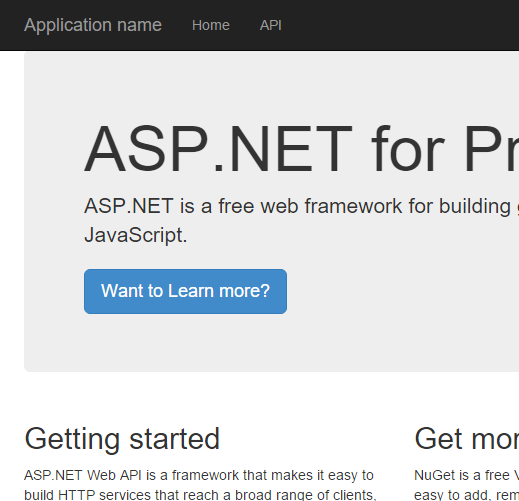 Go to your ASP .net MVC project and add a new class that implements the interface IViewEngine from System.Web.Mvc. And implement the view engine code. Then I create a RazorViewEngine and configured the Partials, View and Master locations to the new folder structure of mine. 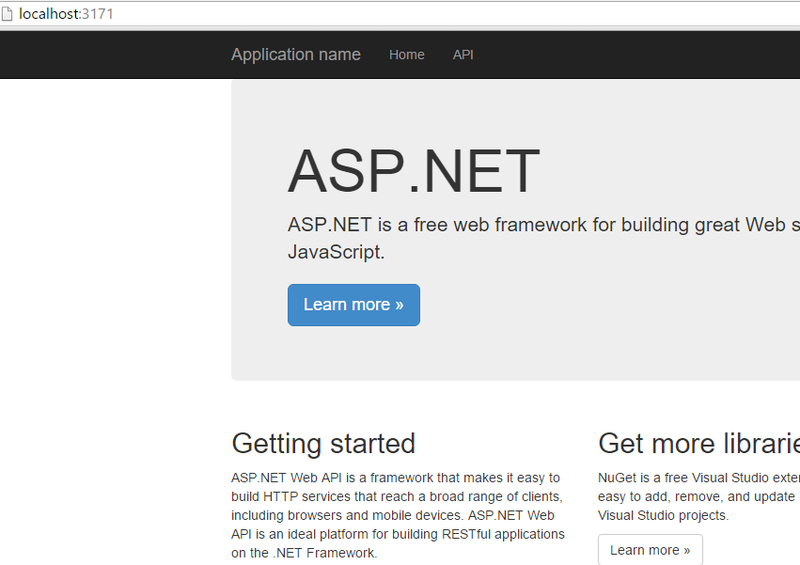 In this case ASP .Net MVC razor will act as normal but start looking for files in my theme folders if they exist. I love the factory and provider pattern so I will use those. As factory I will use DI/IOC framework, I like Autofac but you can use whatever you like the idea is the same. I start by creating one IViewThemeManager interface with one method GetTheme. This interface is the one we use on all the ViewManager providers that will handle all the business rules based on why you want ASP .Net MVC call for another view or partial. 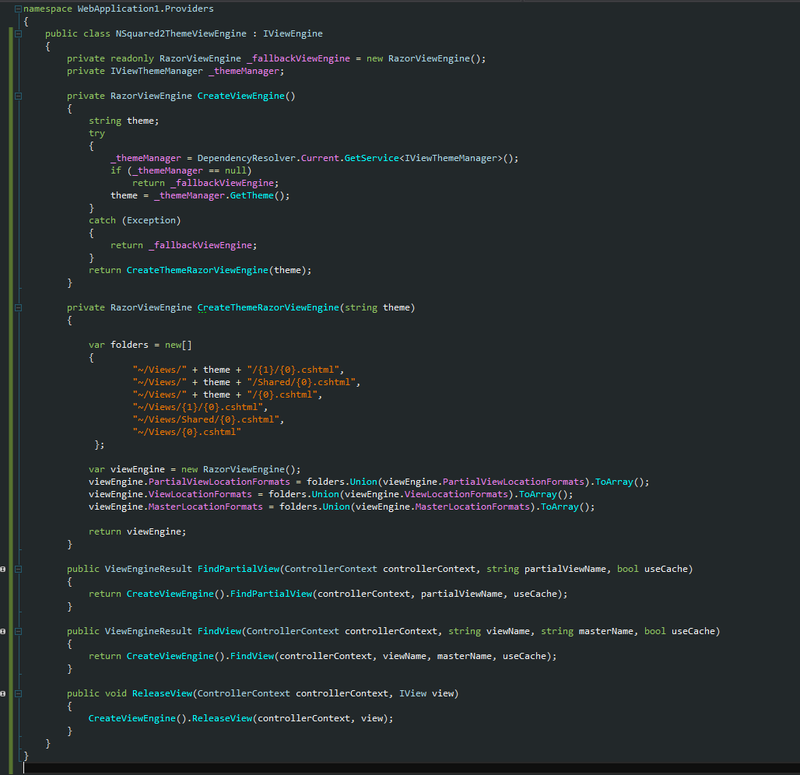 And then I implementation my factory method to the ViewEngine with the IOC and some error handling. 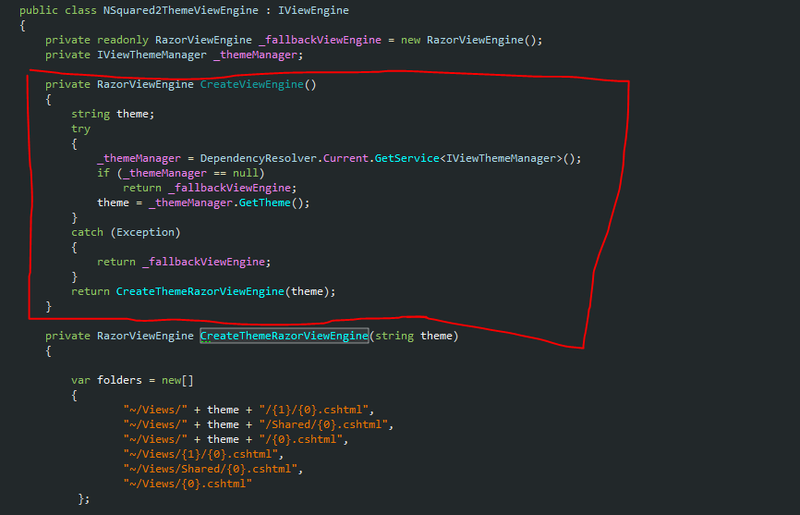 If there is no IViewThemeManager provider configured it will give me null and return the default Razor view engine. That’s why I use the _fallbackViewEngine. If there is an IViewThemeManager provider registered I ask for the Theme which in this case is the folder name I want the view engine to use. In this case I call my CreateViewEngine that will return either the default engine or mine. Now go to Global.asax and clear all View Engines and add this new one in Application start. We can now run the project and everything will work as normal. This because the resolver can’t find any IViewThemeManager provider yet and fall back to default. 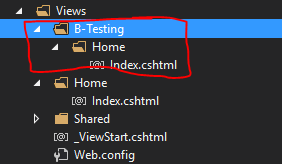 First I copy the index file in my home folder to a new home folder under “B-Testing” and just change the text on the button nothing more. 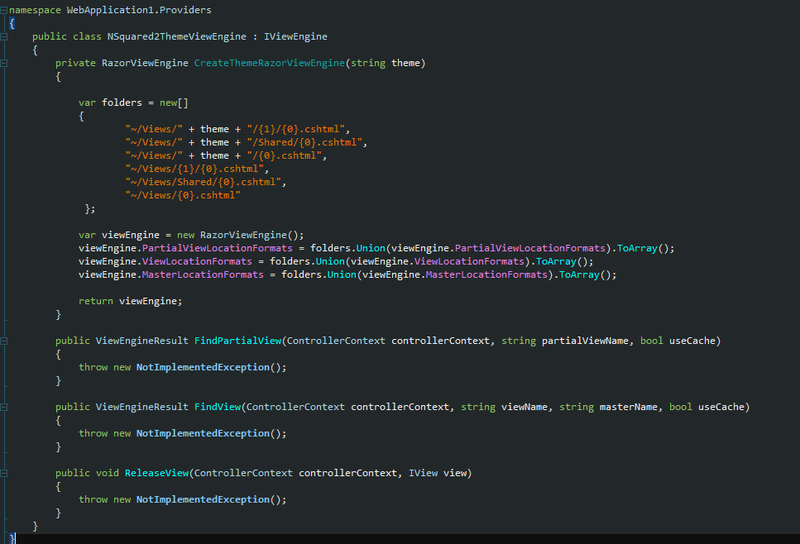 Then I create my IViewThemeManager provider. My ABTestingViewThemeManager. After that I configure my interface and provider with autofac. And when I run the page and if the DateTime.Now.Second contains number 2 it will use my B-Testing view instead. I also added the view rules for partials so you can just test a partial as well if you want to, you don’t need a full view, you can use the default one that just calls for your partials. Just copy your A/B partial to “B-Testing/<your controller folder>” and this code will take care of that too. And if you use partials to render templates for example angular you can even test unique directives and web components if you want to. Just add the angular template in your partial and copy just that partial and its folder structure to the “B-Testing” folder or what name you prefer. You can also add a provider that will give some user a whole new view, layout or webcomponents layout if they are lets say “pro users”. Just add a pro user folder and create a new IViewThemeManager provider that check if the user is of the role pro or something like that. Today I woke up with a notification from my father. It seemed Swedish people had nominated me for contributing to Sweden all this year within development. Because of this I want to tell you my story and hope other finds it inspiring. Me and my brothers game development ended because of school. 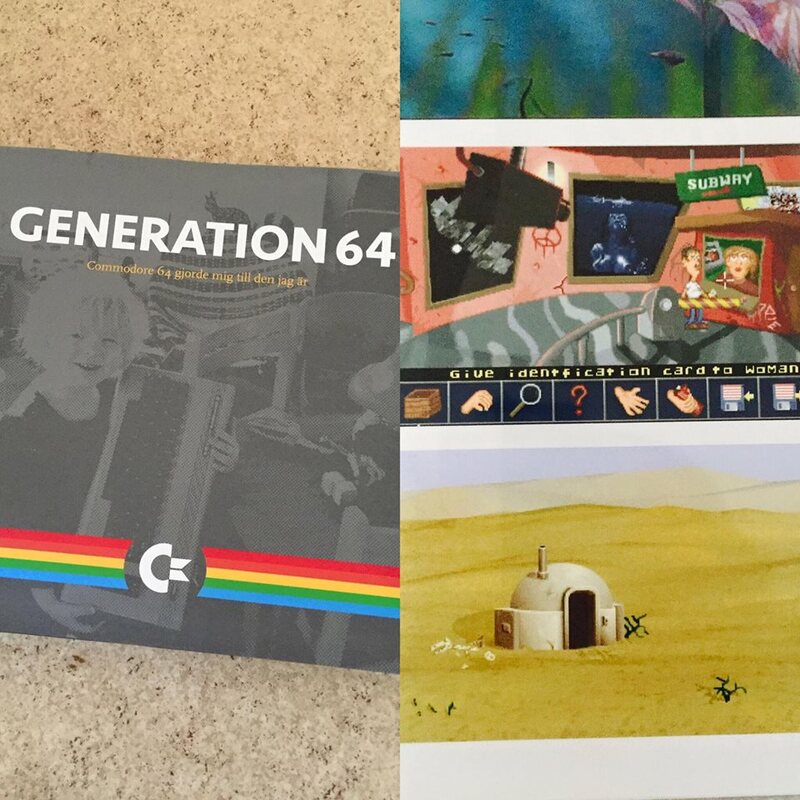 We did some demos, prototypes, and graphics though. I’m not sad that we never finished the games, I’m glad we did not, and all the knowledge it gave us. In the age of 16-17 I got into Media Production school in three years. Under those years we started up a study coffee that was open all day and night for students. They got access to computers and books etc. It was an initiative by the school. We also had this class room “214” as we called it. It was the number of the room. Some geeks sat there all night using computer for surfing the net, play games like MUD and so on. Me and my brother was there working with html and web design. We did our schools first webpage ever J and few people understood html at that time (95-97). So I started to work as a web designer and technical support for an e-commerce company 97-99 directly after school. After a while I started to code more than I did before. Thanks to all this knowledge regarding game design, objects, modules programming was easy to learn. So in few months I was coding front-end, back-end, did database modeling and even stat to inspire other people to create better design with the code. Why do all this lines of code and stuff when you can do it with objects and so on? Went through my head. The Single Responsibility principle (SRP) was in my blood thanks to the modular game design requirements and so on. As soon Microsoft announced next generation internet (ASP+) I rushed in to the beta versions of visual studio. I was one of the first people in Sweden download it so Computer Sweden called me and wanted me to do an article about it. ASP+ ended up with the name .Net later on. I really loved UX, Design, Architecture, database models, clean and nice designed codes and components. It was cool and really amazing. I loved new ideas, new thoughts so I start networking with more people around the world. Java people, Microsoft peoples, designers and so on. I also was one of the top contributors on the leading developer forum “Pellesoft” around 2000-2005. I wrote articles, answer questions. This time I met Patrik Löwendhal (Who got nominated as Top 1 best contributor to Sweden this year 2015). I also reviewed around 22 .Net books for Wrox press at this time. But never wrote my own sadly. I loved this new world, object orientation, architecture, UX problems, code that really needed to get easy to maintain and so on. So I started to contribute to some open Microsoft projects like Enterprise Libraries. The name at that time was Application Blocks. As soon Microsoft started to love XML and added a sea of configuration requirements for those Application Blocks I leaved. I hated when simple things got complicated when not needed. I think I got this from my ideas and experience about user experience and so on. I used the same ideas and thoughts in my code and architecture decisions, and still do. The year was 2003 and I wanted to start consulting, help people to be better programmers and so on. To do that I need more knowledge then games and e-commerce systems. At this time, I also met Johan Lindfors (He worked at Micosoft). We took lunches some times when he visited Gothenburg and talked about user groups and other cool stuff. He mentioned that a person called Joachim Rossberg was also interested in creating a user group so I talked to him and my bother. And this is how the project to create the biggest user group in Sweden got started. There was a User group half active in Stockholm with the same name we wanted to use so I asked if I could use it as well. It was ok the name was SweNug. The main goal with SwenNug was to let people know there is more than just what Microsoft Sweden tell you there is. We wanted people to know that ORM exist, Dataset is the worst idea ever and Domain Driven Design will help people create better and more designed domains. My goal was to make SweNug the biggest user group in Sweden. With all this energy to do good for the developers in Sweden me, Patrik Löwendhal, my brother and Dag König (Now employee of Microsoft Sweden) had an event in Gothenburg called Swenug Architecture Summit. It was an open space event. We got .net people, java people at this meeting. This was the first time I met Jimmy Nilsson (Knows as the Domain Driven Design guru), Roger Alsing (now known as the creator of Akka .Net). We talked about Relationship mappers, Domain driven design, design patters, SOA and lots more. It was a milestone for all of us in our growing carriers. To not make this story to long I will speed up the 12 years after 2003. I talked to seminars like, Swenug, nForum, Developer Summit, Road shows with Microsoft, road shows with Dotway, Pimp My Code with Cornerstone and lots more. Contributed to Microsoft projects, educated students and so on. Steve Ballmer even had a world tour when he talked about an Azure solution I created for Volvo IT and the Twilight Movie. Iit has been wonderful geeky years J And I could not have done all this without all you guys I mentioned in this blog and others I forgot to mention as well. 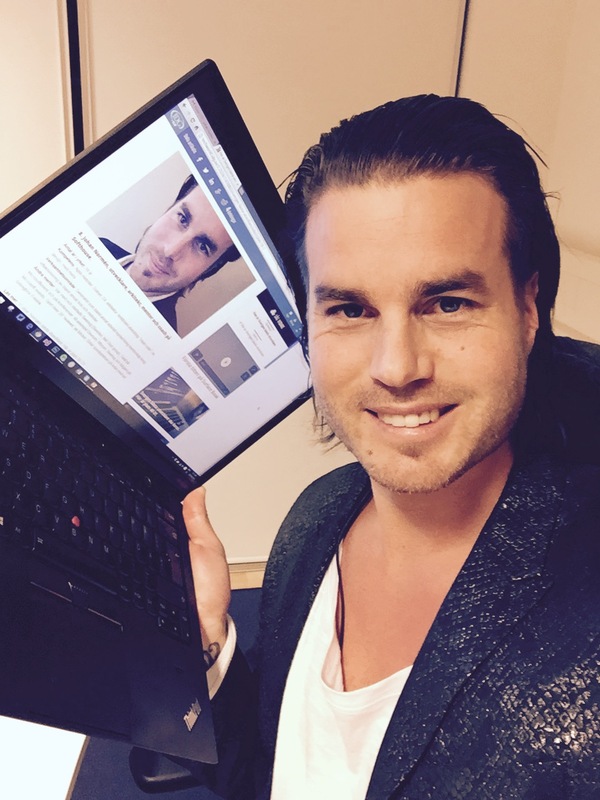 And here I am now… 2015 with the nomination as top 10 contributor for the developers in Sweden. I can say that, it has been fun, lots of work and I have met so many wonderful people out there. That have helped me as well, I got inspired by them, and I hopefully inspired some of them too.